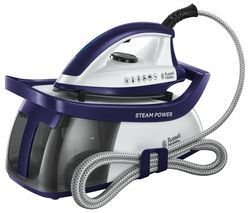 Russell Hobbs is one of the best-known brands for irons and it’s not difficult to see why. Russell Hobbs irons heat up quickly and glide over your clothes to make light work of any pile of ironing. Not many of us have time to spend hours getting through the household chores, so it makes sense to choose an appliance that will make your life easier. Russell Hobbs irons can do just that, and when you use the steam option, even heavily creased clothes will look great in minutes. If you want to look presentable, you need to iron your clothes and a Russell Hobbs iron will do the job quickly and effectively, so you’ll spend less time ironing and more time doing whatever you like. Each Russell Hobbs iron makes use of the latest technology to reduce the amount of energy they need to heat up, so they have less impact on the environment. Russell Hobbs irons are affordable and reliable and no matter how creased or wrinkled your clothes are, you’ll have them looking as good as new in no time. If you’re looking for an affordable solution, check out our range of Morphy Richards irons and if you can’t see one you like, take a look at our collection of Bosch irons. If you need an iron that you can rely on to get through tough creases and wrinkles in your clothes, a Russell Hobbs iron is ideal.